What began as an experiment and then exploded into an Internet phenomenon has now evolved into an incredible success story. The Piano Guys, four talented Dads from Utah, have climbed the Great Wall of China for their craft, landed atop Billboard charts, sold out tour dates around the world, accrued a massive social media following and scored YouTube viewership at 700 million-plus views. Now The Piano Guys are releasing 'The Piano Guys � LIVE!'. 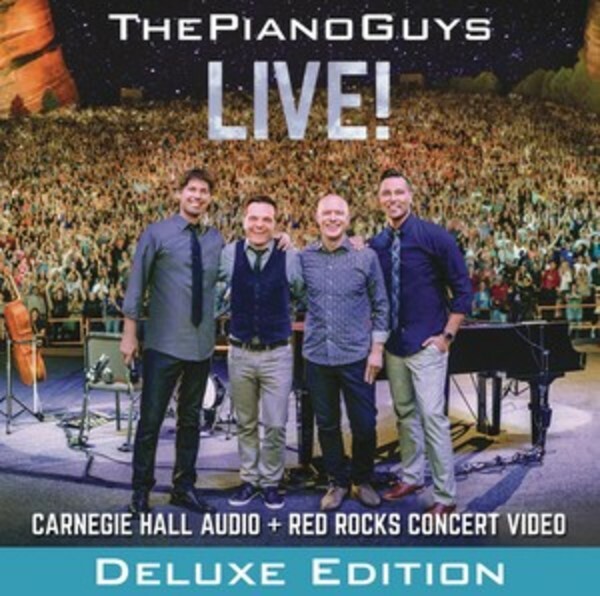 This deluxe package � and ultimate fan piece � features live audio from The Piano Guys� sold out concert at Carnegie Hall in New York City, plus live video from their sold out concert at Red Rocks Amphitheatre near Denver, Colorado. Containing some of The Piano Guys� best-known songs � including 'Let It Go', 'What Makes You Beautiful', 'A Thousand Years' and 'Beethoven�s 5 Secrets' � LIVE! captures the excitement of TPG�s amazing concerts at two of the world�s most impressive venues.